Putting together a tiny kit- suggestions? This is my new fishing kit. I've just put it together, and I'm looking for opinions as to anything I might need to add. I'd prefer to keep it from being too full, otherwise I'll scatter things around every time I open the box, but I'm not sure if I need anything else. I'm currently rearranging this a bit to give me more space. Hooks: Three ultra-tiny (neon tetra sized), three tiny (baby sunfish sized), three very small (juvenile sunfish sized), two small (perfect for juvie to large sunfish), four large hooks for bigger stuff. All are barbless or have flattened barbs. Basically everything but the rod and reel. Fits in my pocket and weighs probably less than five ounces. Any suggestions? Perhaps a small fish-like lure for hunters? Anyone have an example of one? Maybe a fly or two that look like large bugs? I have a target in mind: bass. Many of the rivers and lakes around here have bass, but I've never managed to catch one. I saw someone catch a baby on a piece of worm earlier today, but that's it. What sort of artificial bait is small and would have a decent chance of catching a bass? It doesn't have to be a big one, I'd just like to be able to cover all my bases and have something for the picky predators. Edited by Betta132, 05 April 2015 - 07:25 PM. I like 2 inch floating Rapala in black and silver, and floating rebel crawdads for stream fishing. Fairly hard to snag. Jigs with twister tails are pretty decent as well, but tend to snag up more if fished properly. Alright, I'll look into those. Is there anything under an inch long that would have a decent chance of attracting a baby predator? The case is only about 3" long, so it's a tight fit. I don't need something that'll catch a big predator, I'd use a large lure if I was intending to fish for them, this is just my kit that I can stick in my pocket whenever I might be around a river. Small jig heads and small twister tails. Colors, white, black, purple, and chartreuse. Pretty good all purpose lure. Should I add something to the jig heads to make them a bit more interesting to the fish? As they are, they just look like little spots of color. I'm not sure if a fish would go after that or not. The twister tails go on the jig heads. Ah, I have a couple of those laying around. I'll toss them in. I just never really thought lime green was a good color for a lure... what are the fish seeing when they look at that? Do they just see something brightly-colored and decide to eat it? I'm not only addicted to fishing, but also to collecting tackle apparently. Even though, when I fish, I start off with my favorite lures (depending on the species), I'm always packed with tons of secret lures that my buddies may or may not be carrying. The motive is for me to figure out the pattern of the day, then have enough to share. But, if I was to be disciplined and gear up for only microfishing, then I'd say your plan is a solid one. If you are targeting larger predatory fish, then what to carry depends on what you think will work, what actually works, and when it works...and those are the million dollar questions! Edit: the lure suggestions above are good ones. I wouldn't ignore flies or small jigs, either feathered or soft plastics, worked under a float with an ultralight set up or perhaps a fly rod. In addition, sometimes some of the less familiar baits are good ones to carry especially for panfish. Ice and trout anglers are well aware of these: spikes (maggots), waxworms, mousies and mealworms when tipped on these lures can make a day for you when things are tough. There are some on-line vendors that sell them cheap, but shipping is as much or more usually than the cost of the bait. A fishing guide friend of mine from years past once made the statement about our home waters, "If it ain't chartreuse, it ain't no use! ", meaning that he suggested lure choices on his rivers that include at least some chartreuse. Fish feeding reactions can also be induced by things not seen normally in nature very often. Sometimes, offering something different than what they normally see will trigger strikes. Also, regarding jigs and other small lures like Matt's or Michael's suggestions, take a visit to a tackle store and look at the selection of crappie fishing lures. Just about any of those will catch fish, some better than others. The sizes range from tiny to about 3" long. In addition to twister tails, I've had success on open water and through the ice on tiny tube jigs fished either with or without a float. Tiny shad darts also work well. If you have access to purchasing ice fishing tackle locally, or go on-line, ice jigs fished under a float work really well also. And tiny flies purchased at a local fly shop teamed with a split shot work wonderfully for just about anything that swims in my local streams. I like using tiny nymph patterns. Locally, in our spring creeks, one of the flies that works the best is called the San Juan Worm, and is simply a tiny hook with red thread around it, with some of the thread extending off the hook bend to a tail. Some copper hobby wire wrapped in a segmented fashion around a hook may also work and eliminate the need for split shot because it not only looks attractive to fish, it adds weight. You can pack quite a variety in a small tackle box too. And with my fishing addiction, I often do! If I had to pick one lure to fish all year and catch fish anywhere for survival, this would be it. +1 for small rooster tail. The scanner washed them out a bit, but do these look like they'd work? That whitish rooster tail down there is actually a bright chartreuse. With the exception of the two with the jig heads, I just put these together myself. The tiny one is an attempt at a shrimp or scud, the skinny one went in a damselfly direction, and the other two are just intended to look possibly edible. Do you think they'd work? I intend to add an ice-fishing jig, and then something that looks as minnow-like as possible, and then I think this kit will be about full. Anything else I might need to add? On an unrelated note, my Ebay searching just turned up an 8" long lure that looks like a small pike. What in the world is that for, freshwater sharks? Alligator gar? Edited by Betta132, 06 April 2015 - 04:09 PM. Will those work? I think so. The only way to know is to give them a try and let the fish tell you. Just remember that fish react to lures and presentations differently as seasons progress, so what might not work one day might work a month from now. Point being, don't give up on your lures. Some lures may work in one body of water and not another. Later on, if you find that one or two never seem to work, sub them out and try something new. It looks to me like the blade on the bottom spinner/jig is hooked to the line tie, which might impede the action of the blade, even if it's supposed to flutter. 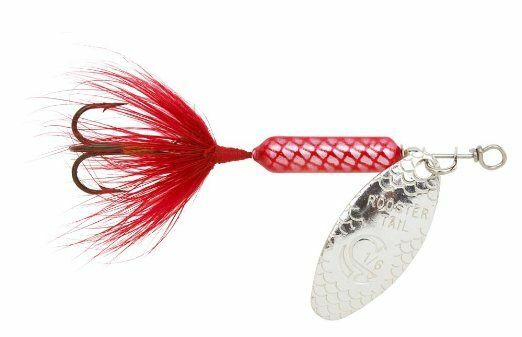 It also looks like the jig with the plastic tail was the original one that the blade was attached too (commonly known as horsehead jigs or a popular brand called a Roadrunner). The attachment point is not the line tie, and is actually a swivel that allows the blade to spin while retrieved or on the fall. Ice jigs come in various sizes, shapes and materials. The two main types of jigs are either horizontal or vertical (dictated by the position of the hook eye). Your jigs above look like mostly horizontal ones, where the eye is perpendicular to the hook. The purple one seems more like a streamer. Vertical jigs resemble that where the eye is in the same plane as the hook shank. Anyway, they all seem to work at one time or another. My most productive ice jigs that I tip with bait are the ones made of tungsten. Most of them are horizontal, and they have a tiny profile but the material is dense and they sink faster than lead, plus I think that they may be more environmentally friendly. 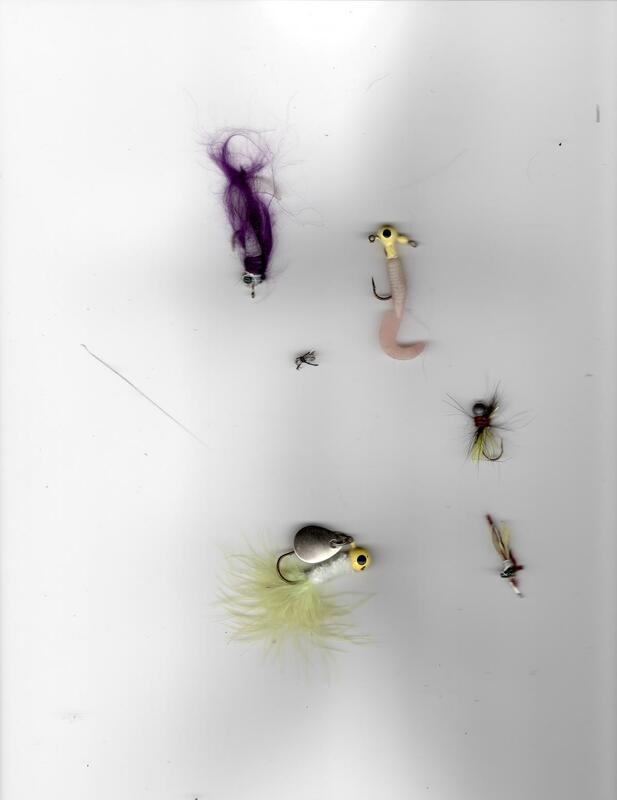 My favorite horizontal jig is called a Ratso. There are three sizes, and I really do well on the glow pink or glow blue through the ice or during open water. I have caught fish on all of the sizes, but the most productive for me has been the smallest size. Sunfish, perch, and crappie really seem to bite them often. During open water, I rig them under a float. The Roostertail that Matt and Kirby are referring to are a brand of spinner. They come in various weights and colors. The weight that you choose to fish or include in your pack would depend on how strong the flow is. You want the lure to get down deep enough to reach the strike zone of the fish, so more weight is better in stronger current, while lighter weights are preferable in streams with low flow. If fishing slow water, lake or river, the depth would determine the weight to use. Lighter weights would be used if the fish are feeding up (toward the surface) while heavier weights would be used when the fish are deep. The heavier the lure, the further it casts also, so that is a factor that should be considered. I usually use 1/8 or 1/16 ounce when fishing larger streams, 1/8 or 1/4 oz. on the river, and 1/32 ounce on smaller streams as a general rule. Colors are personal choices...in general, natural colors "match the hatch" to mimic something in nature and work well in clearer water, while bright colors may trigger strikes out of aggression or curiosity or perhaps when water is murky or muddy. That general rule pretty much covers the use of colors with most lures. This blog post of mine a while back might help a little bit, it's about ice fishing, but the concept isn't much different when fishing open water. The lure discussions are the points that would help. I agree on having an inline spinner or two in there, but in my experience a small Panther-Martin (or Mepps) works better than a Roostertail. Seems they get down faster, stay down better, and trigger more strikes. Also seems they're smaller for a given weight. I'm the kind of fisherman who often has dozens of everything with me on the water. I applaud anyone who can pare it down and be efficient, but I've given up on that for myself. At some point I'm going to get one of those nice compartmentalized tackleboxes with plenty of folding-out sections and lids on the sections, and I'm going to put some of everything useful (that isn't alive) in it. 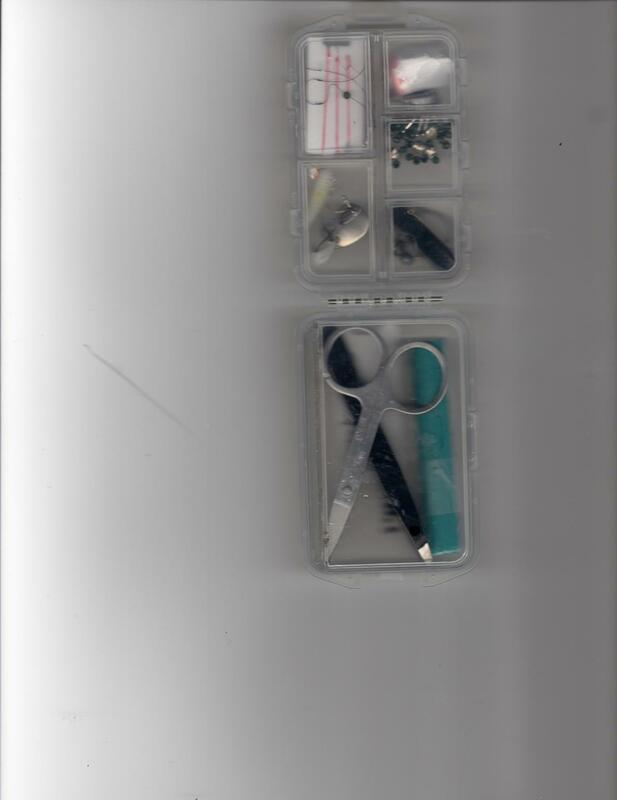 Right now, I'm trying to put together a mini-kit that I can just stick in my pocket whenever I might possibly encounter water, rather than taking an entire box everywhere. At some point soon, I'm going to go and try to catch some bass at a river near us. I'll probably just test everything and see what happens. I think roostertails are more trouble than they are worth. They catch fish, but they are difficult to keep spinning properly. If the fish are reacting to a slow retrieve, then it is hard to keep a roostertail working properly. Just my experience. Some swear by them.